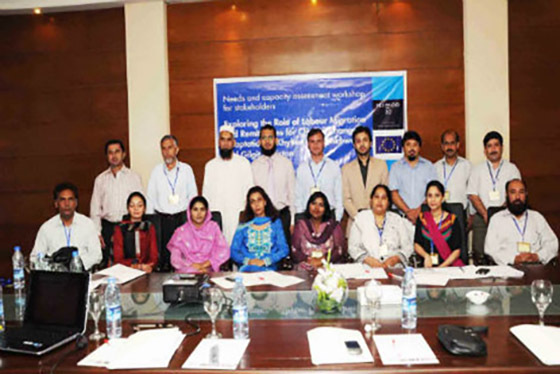 With the aim to identify needs and capacity of local stakeholders for exploring the role of labor migration and remittances for climate change adaptation, a consultation workshop was held on 22 August 2013 in Islamabad, Pakistan. 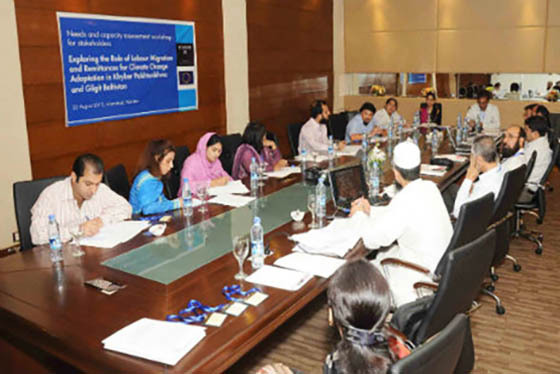 The half-day stakeholder consultation, organized by the International Centre for Integrated Mountain Development (ICIMOD), also sought to identify specific requirements of female migrants and female household members left behind by the male migrants. The workshop, titled ‘Exploring the role of labour migration and remittances for climate change adaptation in Khyber Pakhtunkhwa (KP) and Gilgit-Baltistan (GB): Needs and capacity assessment workshop for local stakeholders’, was part of ICIMOD’s Rural Livelihoods and Climate Change Adaptation in the Himalayas Programme (Himalica). ICIMOD Consultant Dr Rizwan Ul Haq briefly discussed the aims and objectives of the workshop that was attended by over 20 participants from different organizations in Pakistan. “One of our core objectives is to support the development of rural mountain livelihoods in the context of socioeconomic changes and climate change, as well as the conservation of Hindu Kush Himalayan (HKH) ecosystem assets and services through active regional cooperation,” said Dr Rizwan Ul Haq. During the discussion, stakeholders deliberated a number of issues. They were of the opinion that concerted efforts are needed to enable a consensus on the adoption of common policies at regional level to mitigate the climate change impacts and agree clear commitment to support poor, especially the vulnerable communities. Some participants said migration is a highly gendered phenomenon. They said gendered power relations and cultural values together with the gendered division of labour deeply affect the adaptive capacity of women and men. For example, in KP and GB only men are allowed to move out of their villages for employment, while women look after homes and deal with in situ adaptation. They carry out the lion’s share of agricultural work and play a vital role in the management of natural resource. Gendered dimensions of migration as adaptation was also debated among the participants who said a gender sensitive framework of analysis must be explored. Further, the enhancement of knowledge and research based on HKH ecosystems must have practical focus on policymakers and analysis of community responses to environmental change in terms of broader socio-economic circumstances. Other discussions revolved around the reduction of vulnerability and enhancement of capacity to adapt to a changing climate at local level achieved by empowering communities to make their own decisions through mobilisation and micro-planning processes; augmentation of awareness and knowledge among stakeholders about impacts of global warming and threats to ecosystems, communities, and infrastructures; and a proactive approach to the reduction of vulnerability and enhancement of adaptive capacity of groups most at risk, addressing social processes that lead to vulnerability and structural inequalities. The participants agreed that the communities of KP and GB are poor and will not be able to respond to such massive events such as floods and droughts caused by climate change. They need long-term projects for their capacity building and preparedness. There should be community-based disaster risk management, adaptations, and mitigation-enhancing activities to save lives, livelihoods, ecosystems, biodiversity, and infrastructures. The workshop outcome will be used for designing an action research on the role of labour migration and remittances for climate change adaptation in KP and GB.